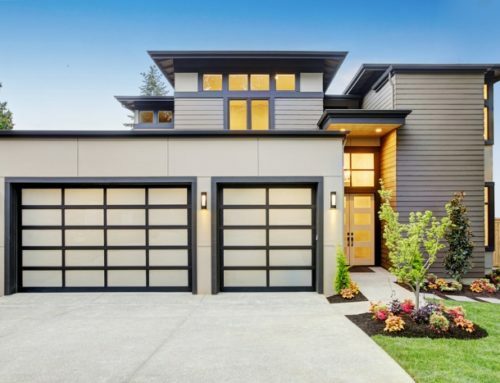 When hunting down a roofing system to match your needs, one of the most critical elements you want to know is the longevity. We’ve talked about the different roofing systems as well as their qualities and downsides. 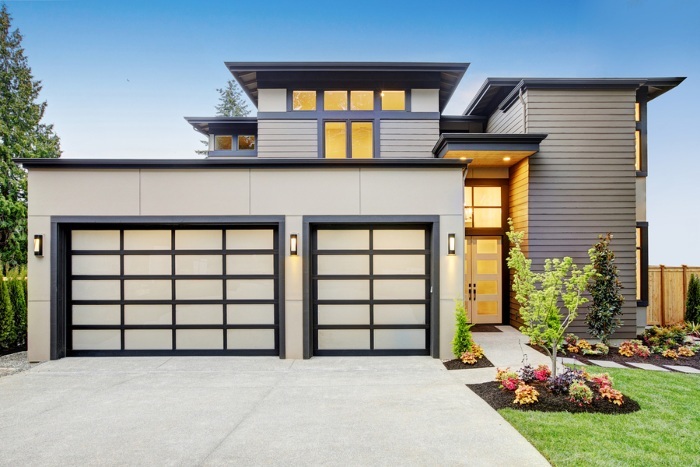 This time around, we thought of focusing on the torch on roofing life expectancy to give you a clearer understanding if this is something you’d like to explore. Let us begin by explaining what a torch-on roofing is all about. When you say “torch-on”, you might have an image in mind. But do we exactly know what happens in the process and what are the elements involved? 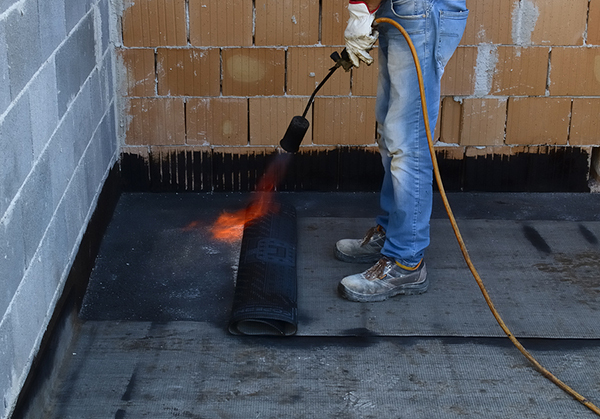 This photo shows the process of how the material is heated so that it would completely adhere to the roofing surface. 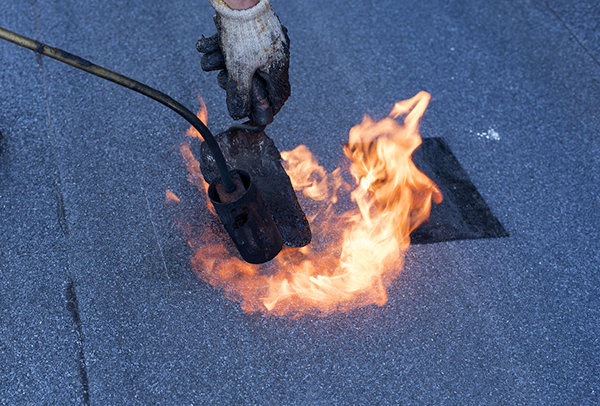 Torch-on or sometimes referred to as torch-down roofing is a combination of two ingredients (modified asphalt and resin). These two main base materials are melted together using a torch to form a thick layer. This layer now becomes a waterproof material that is ideal for both commercial and residential use. Clearly, the name was derived from the method of application — by using a torch. It’s important to note that this type of roofing is more commonly designed for flat or low-sloped roofing. 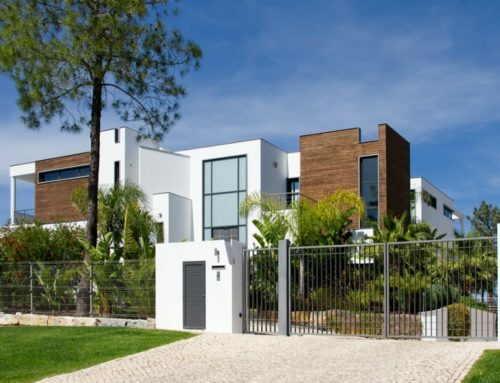 Its average price per square feet can range from $300-$1,000. How is it Different from Tar and Gravel? Some people confuse torch-on roofing with tar and gravel. However, these two are different materials. For one, torch-on doesn’t have gravel ballast. What does this mean? Technically speaking, it is lighter than the other. The absence of gravel also eliminates the chances to for it to clog up drains or eavestroughs. In tar and gravel, you’ll notice that there are granules present to complete the application and installation processes. Another notable difference is its odor. 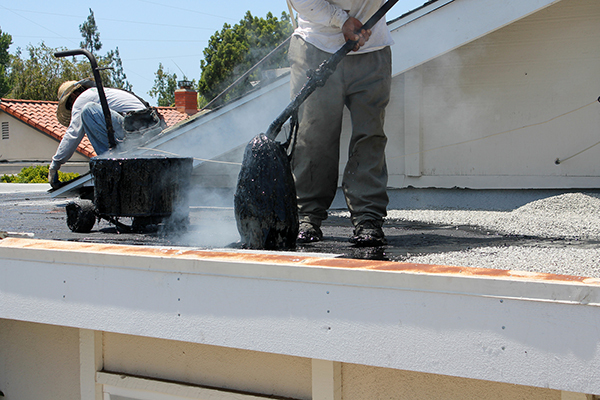 Tar and gravel can produce a strong odor during application which can be harmful to one’s health. As for torch-on, there’s a tolerable odor that wouldn’t prompt homeowners to leave the house during the installation process. What’s the Torch On Roofing Life Expectancy? The million-dollar question, “what’s the torch on roofing life expectancy?” We all want to know! 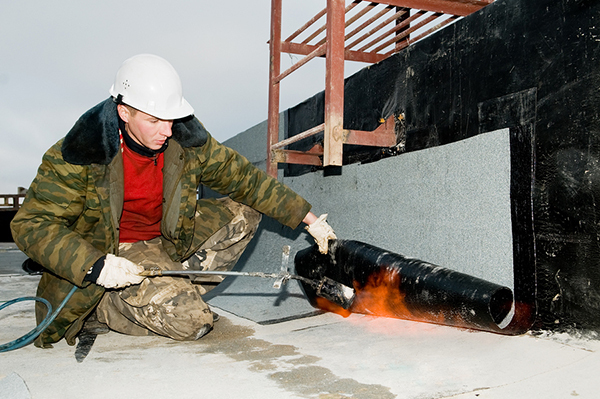 Well, unlike other flat roofing options, a torch-on roofing can only last for 15 to 20 years in an average. Some, however, can reach until about 30 years depending on external circumstances as well as the maintenance. Torch-on roofing life expectancy may not be as long lasting as you may have expected. Or it may not come close to how long other flat roofing systems last. However, a torch-on roofing does have qualities that compensate its shorter life service. Also, for the majority, this life cycle is already ideal due to their future plans and priorities. Some may want to resell their property after a few years. It really depends on how you would look at things. Besides, re-roofing isn’t a big issue with a torch-down roofing. The torch-on roofing is extremely durable. It has a superior strength that it can resist tears and punctures due to various external factors like walking on the surface. In relation to this, it’s also low maintenance as you can leave it as is for many months without worrying about its condition. Workers can access the surface as well without having to fear about inflicting damages. While torch-on roofing may be low maintenance and durable, it doesn’t mean you have to ignore it for a long time. Proper and regular maintenance is still the key to a long-lasting roof (regardless of the material you choose). If you’re planning for future home improvement projects such as skylight installation, it can go well with a torch-on roofing. Professional roofers can easily cut and modify the area where you want to position a skylight, for example. This material is also highly effective even in hotter seasons. It can effectively reflect UV rays keeping the interior cool. In the long run, it can help you save on electricity bills as it keeps the need for air conditioning units minimal. If you’re looking for a roofing system that has very good waterproofing capabilities, you can count on torch-on roofing. If you’re living in an area prone to storms, then you wouldn’t have to worry about leaks because the material is proven to be watertight. The edges are completely sealed off protecting you against water damages. The worker is sealing the edges to make it completely waterproof. While a torch-on roofing is proven to be waterproof, the installation process still plays a huge role. Faulty installation could lead to premature leaks and damages. Hence, work only with a roofing company that has a good record in the industry. Make sure that the workers are armed with the right skills and equipment so that you wouldn’t be sorry in the end. If there are positive things to note, of course, there’s another side to it. We cannot dismiss the fact that all roofing systems, the torch-down roofing included, have their own weakness. It’s important to identify these drawbacks earlier than to be caught off guard. By tricky we mean it’s not as easy as it may seem. There are equipment and tools that should be only be handled by professionals. Otherwise, you may get into serious accidents. For instance, when the tools overheat, they can cause a fire. This is also the reason why you need to hire the most credible and experienced group of roofers. Every roofing project’s success lies in the hands of the roofing company. Hence, make sure you select the right one. This is common among flat roofs. Yes, there are slight pitches to drain water, but they do have the tendency to pool water especially after a snowstorm or a heavy rainfall. The good news is that there’s a solution to this issue. 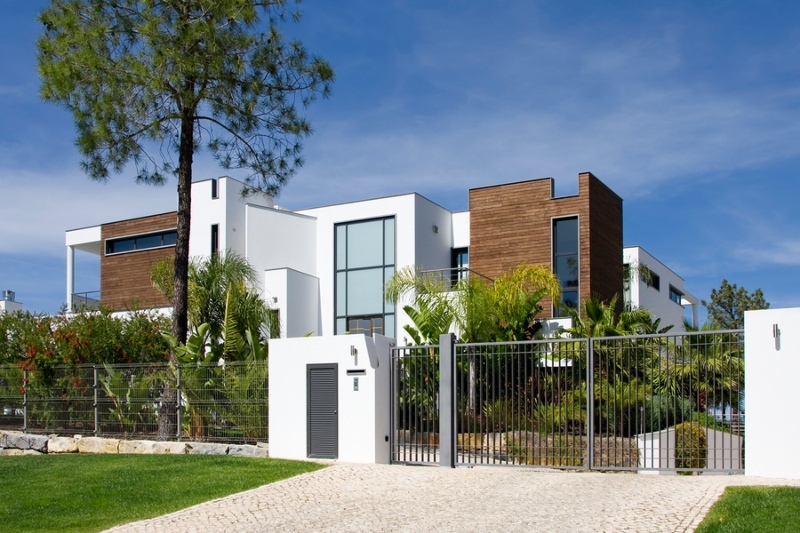 If you want to avoid pooling of water that could lead to other severe water damages, make it a point to conduct inspections and maintenance regularly. In this way, all potential problems are addressed before they spread or worsen. There you have it, the most important things to keep in mind when choosing a torch-on roofing. We have also talked about torch on roofing life expectancy and how it is compared to other options. While it may not be as long-lasting as some options available, it is still highly reliable in terms of strength and functionality. Want to know more about torch-on roofing? Still unsure if this is applicable for a St. Clair Shores property? Talk to Miller’s Home Improvement roofing specialists and receive a free quote: 248-266-4657.